Periodic table of elements for your iPod (was periodicPod). Is there a better alternative to ChemDuet? Is ChemDuet really the best app in Science category? 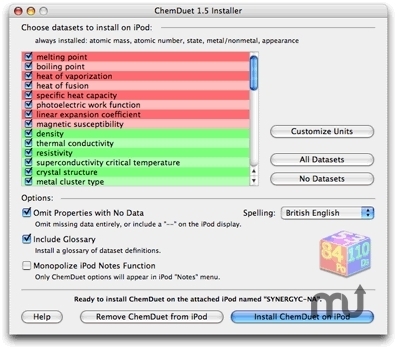 Will ChemDuet work good on macOS 10.13.4? Quick access to a wide variety of atomic properties, wherever you go! Easily adjust units of properties stored on iPod. Easy to use iPod-style interface. User configurable--choose what data you want to load onto your iPod. ChemDuet needs a review. Be the first to review this app and get the discussion started! ChemDuet needs a rating. Be the first to rate this app and get the discussion started!